Hand-harvested, pure & natural British sea salt with real vanilla for a sweet undertone. 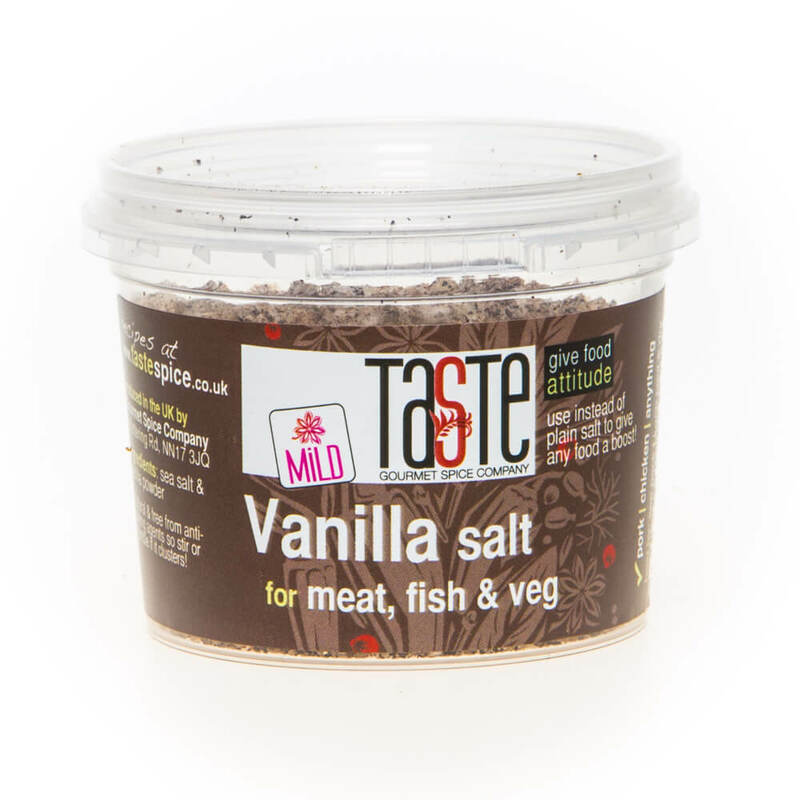 Because vanilla is actually a spice (though you’re used to having it in sweet things), it’s robust enough to liven up any fish dish to bring out an extra depth of flavour that will surprise you. PLEASE NOTE: picture is if Vanilla & Fennel salt, but we've changed it by adding even more vanilla & dropping the fennel to make our fab new Vanilla Salt! Add a pinch to any pork or fish dishes – it makes fab pork crackling! Use it as you would any other sea salt: either cook with it or add a pinch to season food and you’ll get that extra kick of taste from the flavour infusion. Available to buy in a 3 pack. If you prefer you can choose alternative second and third flavoured salts from our wide selection. Very pleased with the items and came very quickly. This was bought as a gift, so I can only comment on the delivery and appearance of the hamper. It arrived promptly, and well packaged. There was accompanying literature giving advice on how to use the contents of the pack. Overall, I felt it was an attractive, interesting gift. Bought as a gift - fast delivery and my son and his wife very happy with gift. Was bought as a birthday present. Really lovely product. A slight error with the order which was fixed kindly and promptly. I'm really happy with the order, will make a great present for Father's Day. Highly recommend, a great company with great products. This was a birthday present and it ticked all the right boxes. This was a great combination, will definitely be switching to these from now on! This product is dispatched by Gourmet Spice Company. This item has a shipping weight of between 240g and 240g depending on the options selected.